A lot of how we live life affects our health. From fast food to being sedentary, there’s a long list of things that can have a negative impact on our overall well-being. If you sit in an office for work, you’re probably familiar with neck, shoulder and back problems. Sitting all day in the same position, especially if you don’t have good posture, can have detrimental effects on these parts of your body. Let’s take a look at one health condition in particular and see how it impacts those who suffer from it. First of all, let’s break down what we’re talking about. So what, exactly, is Thoracic Outlet Syndrome? The Mayo Clinic explains that this is actually a group of disorders associated with the neck and shoulder area. This grouping of disorders occurs when nerves or blood vessels located in the space between your ribcage and collarbone are compressed. This can result in chronic pain in your neck and shoulders, along with numbness in your fingers. Neurogenic thoracic outlet syndrome: this particular type of TOS disorder manifests in the form of compression of the brachial plexus. This is a group of nerve endings that originate in your spinal cord. They are responsible for movements in your shoulder, arm, and hand. In the majority of these cases, the symptoms are neurogenic. This means that they come from the nervous system. 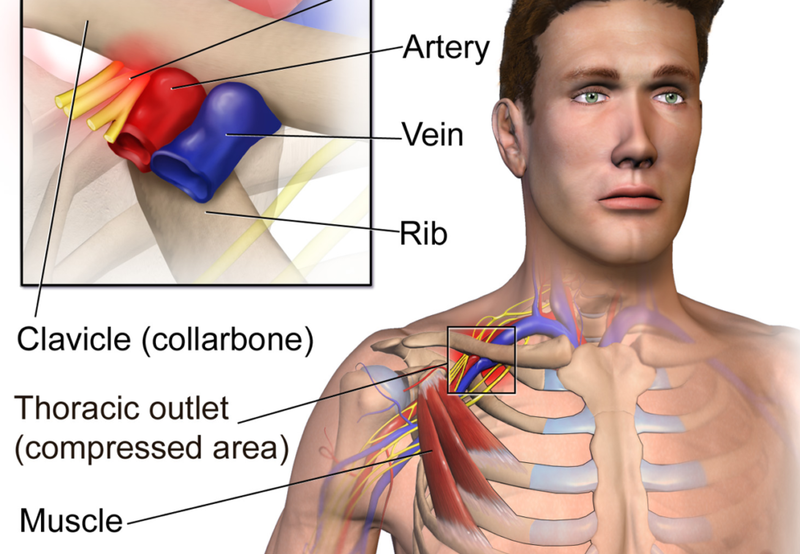 Vascular thoracic outlet syndrome: this type of syndrome occurs when the veins and arteries located just underneath the collarbone are compressed. Non-specified thoracic outlet syndrome: this is the most ambiguous of the three syndromes. This is because doctors struggle to locate precisely where the pain is coming from. People with this type of health condition have chronic pain in the thoracic outlet area, which gets worse with activity. One major cause of TOS is chronically contracted pec minor muscles. The pec minor muscle is located underneath the pec major muscle. Both run along the top of your chest, underneath the collarbone. The pec minor muscle can become aggravated by poor posture – hence the correlation between this syndrome and sitting in an office. The worse your posture is, the more contracted the pec minor becomes. This can soon result in the development of TOS. Now that we’ve described the three possible syndromes you could experience under the thoracic outlet syndrome umbrella, let’s take a look at symptoms of these syndromes. Neurogenic thoracic outlet syndrome can cause wasting of the muscle in the fleshy part of your thumb. It may also cause tingling or numbness in your fingers or arms, pain in your hand, neck or shoulder, and a weakened grip. For vascular thoracic outlet syndrome, you may experience the following: discoloration in your hand, swelling and pain in your arms, blood clots in upper body, a lack of color in your hands, no pulse in the affected limb, cold extremities and arms, fatigue of your arms with activity, tingling or numbness in the fingers, throbbing close to your collarbone, and weakness in your neck and arms. There are a number of ways doctors can diagnose thoracic outlet syndrome correctly. The diagnosis stage of your experience with thoracic outlet syndrome is essential – it will help determine the particular type of treatment you need. Cleveland Clinic says that typically, vascular doctors and health professionals treat symptoms associated with thoracic outlet syndrome. To correctly diagnose your condition, your doctor will conduct a complete physical exam as the first step. If you require further testing, you may be referred to a neurologist. This is important because they’ll be able to rule out other possibilities like cervical disease. Other health conditions can closely mimic the symptoms associated with thoracic outlet syndrome. While you may be thinking that thoracic outlet syndrome sounds quite serious, luckily, it’s treatable. However, some complications may arise with this type of condition if it’s left untreated for too long, so we strongly recommend getting an early and precise diagnosis. As we’ve mentioned, thoracic outlet syndrome is entirely treatable. Let’s take a look at the various treatment options available. Dr. Axe talks about exercising, physical therapy and stretching being effective treatments for this health condition. Finding a custom-made exercise program that’s going to strengthen and mobilize both your neck and shoulder muscles will help immensely in the improvement of this condition. Physical therapy is another useful treatment option. Deep-tissue massage is particularly beneficial. You can either get a healthcare professional to perform deep-tissue massage on your problem areas, or you can learn how to do so yourself. Side Neck Stretch: do this stretch sitting down. In a chair, place the hand that’s suffering behind your head. Turn your head away from the side that’s causing your pain, tilting it ever so slightly down. Inhale and then exhale slowly while holding this pose. Chest Stretch: this stretch also requires you to be sitting down, at a table. Place your arms on the flat surface in front of you. Lean forward from the waist up while extending your arms as far as they will reach. Shoulder Stretch: stand against the table this time, with your back to it. Bring your hands around and try to grasp the table with your fingers. Allow both your knees and elbows to bend. While TOS is treatable, it’s also preventable, too. Try mixing things up at the office. This includes adjusting your chair and work surface so that you avoid sitting hunched with a slumped posture for eight hours a day. Stress is also another culprit when it comes to TOS. Try taking time out of your work and home life schedule to have some you time, in order to decompress and eliminate any stress you may feel. It might not feel like it’s directly working, but it will be doing wonders.